Its moniker is pretty confusing, as this hobo doesn't seem to have anything to do with baseball. It does have many of the hallmarks of a Kathy Van Zeeland accessory though, including bold studs, a belted accent, and an animal printed version. Personally I'd steer clear of that leopard spotted creation; the hobo looks much cleaner in a matte synthetic. But Kathy Van Zeeland wouldn't be Kathy Van Zeeland if she didn't give us the option of being over the top! I appreciate that Kathy Van Zeeland has opted for a buckety shape rather than the traditional hobo crescent. It affords us extra storage space, which is always a plus. Kathy Van Zeeland backs up those generous dimensions with a zippered pocket and trio of open gadget pouches. And remember, we can also utilize those zippered pockets at the front for the items we want on hand. For $89 Kathy Van Zeeland has delivered a solid hobo with the Line Drive. It probably won't earn the designer many new fans, but it's likely to serve the label's devotees well. 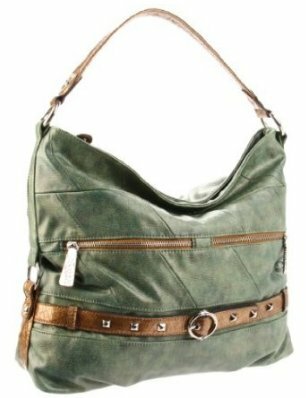 The Kathy Van Zeeland Lounge Lizard hobo bag, a great alternative to this hobo bag.